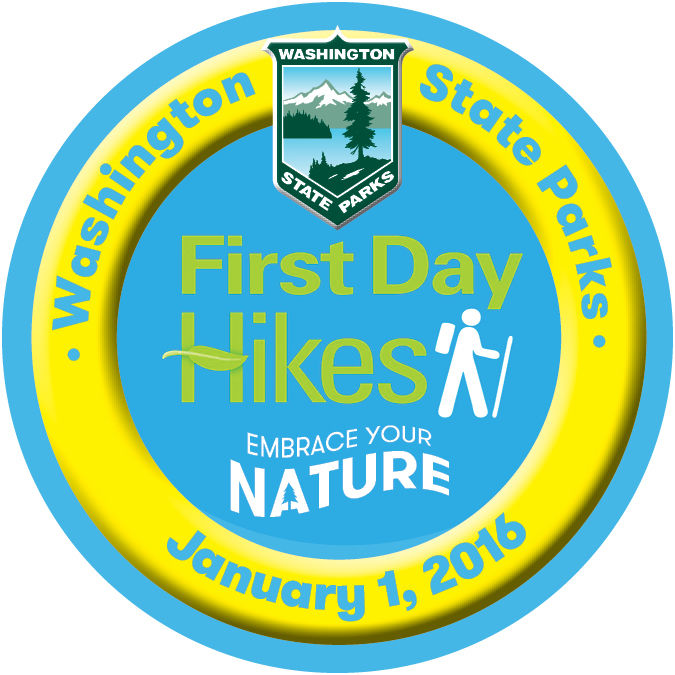 OLYMPIA – Dec. 18, 2015 – The Washington State Parks and Recreation Commission invites the public to celebrate the first day of 2016 with First Day Hikes taking place at more than two dozen state parks on Jan. 1. In the spirit of the new year, Washingtonians are encouraged to start 2016 with a healthy hike and connect with the diverse natural resources and recreation opportunities found at state parks across Washington on New Year’s Day. Many parks will have guided hikes, with expertise provided by rangers and volunteers. Some of the hikes will be fat-tire bike rides, snowshoe treks, as well as a 5K run. Events will take place in a diverse and dramatic range of landscapes including coastal beaches, islands, waterfalls, lowland forests, historic military batteries, geological points of interest and more. Jan. 1, 2016 is a State Parks ‘Free Day.’ Participants will not need to display the Discover Pass on vehicles to access state parks for the New Year’s Day activities. The First Day Hikes program is part of the America’s State Parks First Day Hikes national initiative organized by the National Association of State Park Directors. The nationwide event first started at Blue Hills Reservation, a state park in Milton, Mass., more than 25 years ago. Since 2013, all 50 state park systems have participated in the First Day Hikes program. For more information about hikes across the country, visit: www.naspd.org/initiatives-special-programs/first-day-hikes/. Participants of all ages are welcome, unless otherwise noted with suggested minimum age. Most parks will provide refreshments, thanks to a donation from the Washington State Employees Credit Union and the Manufactured Home and Recreational Vehicle Association. Lake Wenatchee State Park: Take a scenic 2-mile easy snowshoe journey along North Park Snowshoe Trail. Meet at 11 a.m. at the North Park Sno-Park. In addition to a Sno-Park Permit,* participants will also need a Special Groomed Trail Permit. Participants must be 10 years of age or older to participate. Please leave pets at home. Snowshoes are required. Twenty-Five Mile Creek State Park: Learn about horticulture and how State Parks sustainably manages its properties. View areas of forest burned by last year’s wildfire, while learning about fire suppression and forest management. Meet at 11 a.m. at the park entrance. Bridgeport State Park: Explore the flora, fauna and geology of the northern Columbia River region near Chief Joseph Dam on this easy 2-mile hike. Meet at 9 a.m. at the boat launch parking lot. Lake Sylvia State Park: Learn about the history, native plants and animals of the area. A park ranger will lead a 2-mile hike along the trail that loops around the lake. A volunteer will lead a shorter hike as well. Meet at 1 p.m. at the kitchen area. Westport Light State Park: Take a 45-minute guided hike to learn more about the history of the area and gain some insight on the dynamic nature of the Pacific coast. Meet at 10 a.m. at the park. Cama Beach State Park: The park is offering two hikes—a short family-friendly stroll with lots of stops for photos starting at noon and a brisk, heartrate-raising hike beginning at 2 p.m. with commanding views of Saratoga Passage and beyond. Meet up for both hikes at the parks’ shuttle drop-off shelter. Camano Island State Park: The park will be offering two hikes as well. The first hike, beginning at noon is 3-mile hike on the park’s Loop Trail with a focus on exercise. The second hike starts at 2 p.m. and is a leisurely stroll along the Al Emerson Nature Trail. Meet at the group cabins for both hikes. Deception Pass State Park: Take a 2-mile hike out to Hoypus Point on Cornet Bay, an easy hike with views of the Deception Pass Bridge, Mount Erie and several small islands. Meet at 10 a.m. at the Cornet Bay boat Launch. South Whidbey State Park: The park will have four hikes, rating easy to moderate in difficulty. Volunteer guides will explore art and youth in the outdoors, new interpretive signage, forest ecology and winter birds. All hikes begin at 10 a.m. and leave from in front of the Ranger House. Dosewallips State Park: Take a 3-1/2-mile hike along the Steam Donkey Loop Trail—where saltwater and classic northwest forest meet. Meet at 11 a.m. at the day-use shelter. Fort Flagler Historical State Park: The ranger-led 3-mile roundtrip hike will take participants along the Bluff Trail, with a chance to explore the fort’s historical gun batteries and enjoy the views of Port Townsend Bay and Admiralty Inlet. Meet at 11 a.m. at the park office. Fort Worden Historical State Park: Following a brief historical talk, take a hike up to Artillery Hill and explore the many coastal defense gun batteries in the park. Meet at 1 p.m. at Memory’s Vault. Cedar Butte (Olallie and Iron Horse state parks): This ranger-led, 3-mile hike will take participants up to the top of Cedar Butte to learn about the significant 1918 flood that wiped out a nearby logging town. Meet at 10 a.m. at Cedar Falls Trailhead in Iron Horse State Park. Dash Point State Park: Take a nature walk at 10 a.m. or a beach walk at noon—or both. A park volunteer will also lead a Junior Ranger program at 11 a.m. at the park’s amphitheater. Hikers should also meet at the amphitheater. Flaming Geyser State Park: Learn about this park’s role in regional mining history while exploring the local flora and fauna. Part of the tour involves hiking a steep staircase. Meet at 10:30 a.m. at Shelter 2. Nolte State Park: This family-friendly hike around Deep Lake will wander through the forested Green River Gorge. Meet at 10:30 a.m. at the park’s main bulletin board. Saltwater State Park: Explore the legacy and influence of the Civilian Conservation Corps (CCC), which built much of the park during the Great Depression. Take a nature walk, beginning at 10 a.m. and/or a beach walk at noon. Tour the CCC Cabin during an open house from 10 a.m. to noon. Meet at the CCC cabin. Potlatch State Park: A park ranger will lead hikers through an old-growth fir forest down to a shellfish beach on the shores of Hood Canal. Meet at 10 a.m. at the day-use area near the beach. Twanoh State Park: This hike combines history and nature on a 2-1/4-mile hike through a forested creek and by Civilian Conservation Corps structures built in the 1930s. Meet at 10 a.m. at the campground. Alta Lake State Park: Explore the plants, wildlife and geology of the Alta Lake and Goat Mountain region. Join a discussion about local history and last summer’s wildfire season and learn how to “Leave No Trace” while enjoying the outdoors. Meet at 1 p.m. at the entrance booth. Pearrygin Lake State Park: This “hike” will actually be a bike ride—on fat-tire bikes—or a snowshoe walk. Participants can rent fat-tire bikes from several stores in the Methow Valley. A free barbecue lunch will take place following the day’s activities. Meet at 10 a.m. at the east Welcome Center. Cape Disappointment State Park: Explore the wild coastline overlooking the Columbia River with a park interpretive specialist. Learn how waves, currents and tides interact in this dynamic environment. Meet at 11 a.m. at the Benson Beach Amphitheater parking lot. Lime Kiln Point State Park: Hike along the 2.5-mile Lime Kiln Trail overlooking Haro Strait and Vancouver Island. Finish off the day with a tour to the top of Lime Kiln Point Lighthouse. Meet at 1 p.m. at the Interpretive Center. Rockport State Park: Several hikes will take place at different times during the day. The first three hikes will follow the Sauk Springs Loop Trail, beginning at 10 a.m., 11 a.m. and noon. The final hike of the day is a 3-mile hike on the Evergreen Loop Trail and begins at 1 p.m.
Wallace Falls State Park: Join a park ranger for a 2-mile hike up Woody Trail to Middle Falls, the most impressive of all nine falls in the park. Continue past Middle Falls or return to the trailhead. Meet at 10 a.m. at Woody Trail. Riverside State Park: Depending on the snow conditions, the ranger-led hike will either follow the Deep Creek Interpretive Trail or the Centennial Trail. Learn about the natural world of the park and about the history of the Civilian Conservation Corps that built the park in the 1930s. Meet at 1 p.m. at the Deep Creek parking lot. Millersylvania State Park: This hike will actually be a 5K run, led by a local ranger, around the perimeter of Deep Lake. Meet at 9 a.m. at Kitchen Shelter #1.